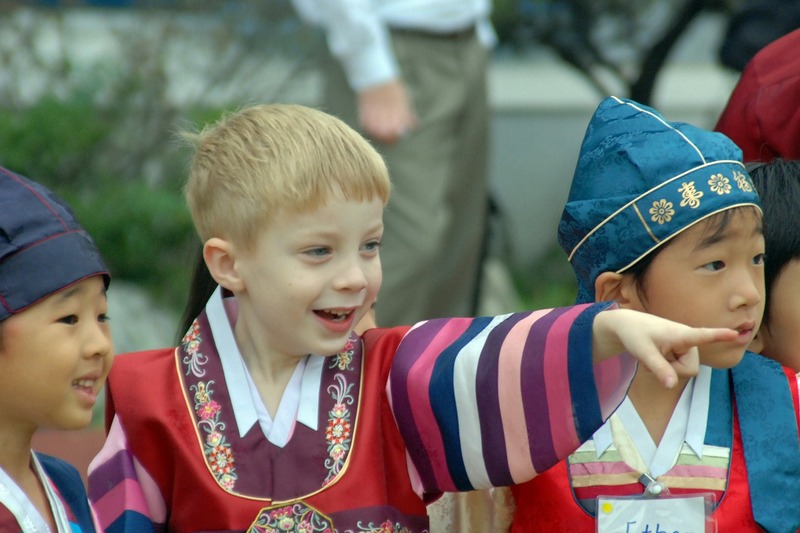 Today, May 5th, is Children’s Day in Korea. And because it’s a national holiday, we didn’t have school! Last year I blogged about the history of Children’s Day here. This year, we decided to go out for ice cream (it’s a special treat here) and then headed to a grass park for the kids to run around on. Grass is hard to grow here because the soil is rocky and the climate isn’t too good for it either. Plus we live in a city of 10 million, so concrete reigns! The boys raced and watched the train run into the tunnel underneath us. Days like today make me feel like the world is full of promise and hope. Oh, and check out Victoria’s site for a really great event with Laura! How about you? What makes you sit back and smile and know that all is right with the world? 14 Responses to Happy Children’s Day! Lately it’s a bit hard. But the birds singing in the morning help keep me grounded. Yay for Children’s Day, that’s the cutest holiday ever. The picture is wonderful!! The beautiful sunshine and birds chirping away, it’s hard not to keep a smile when they love the air as much as I do! Happy national no-school holiday! All is right with my world when my kids and their families are happy and healthy. Add a spring or summer morning in my yard at 6am, or lying in bed listening to mourning doves or rain on the roof, and it’s wonderful. I’m with Bish. Those birds singing are my daily wake up call to happiness! Happy Children’s Day! Happy Children’s Day – what a great thing to celebrate! Personally I would like to do away with all chirping birds, so I’m going to say what makes me happy is the sun. It’s so nice to see London with a blue sky! The warmth of sunshine makes me happy! Oh these are such great ideas! it was Cinco de Mayo here in the US, and my son’s 9th birthday! Every day should be children’s day. And mother’s day. And people day. I just read an earlier post of yours – on writing crap. My response: Just write and write and write. And save everything. I’m glad I’ve saved what I did over the years, but I threw away too much. Don’t toss – unless it’s really scrappy. You never know how you might be able to use all the rough stuff later. And it’s fun to remember who you were – back then !! I still think this is such a cool holiday. Wish we had it! And I wish we had awesome robes and costumes, too! Cute picture! For me, all is right with the world when my garden is in bloom and the sun is shining. Come on Summer!